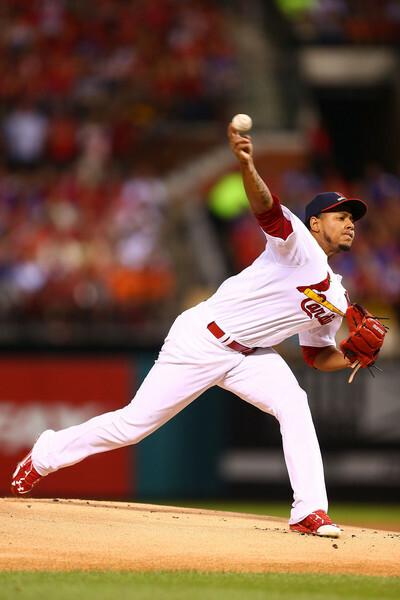 Carlos Martinez vs. Shelby Miller: Did the Cardinals make the Right Decision? Early this past offseason, the St. Louis Cardinals and Atlanta Braves agreed to a blockbuster trade that sent Shelby Miller and prospect Tyrell Jenkins to the Braves in exchange for Jason Heyward and Jordan Walden. As with many big trades, this one has been continuously analyzed to determine who is the “winner” of the trade. However, this article will not perpetuate this trend because it seems pretty clear that the Braves will receive the most value from this trade, not because Heyward hasn’t become the offensive threat many hoped for, but because Shelby Miller has transformed himself as a pitcher and come back strong from a weak sophomore campaign. Instead, this post will look at whether the Cardinals made the right decision to trade Shelby Miller over Carlos Martinez, who was the Braves’ preferred choice in the trade. Both pitchers are enjoying breakout seasons, but which one has the brighter future? The above graph displays each pitcher’s numbers so far in 2015. I did not have much faith in Miller coming into the 2015 season. He was coming off a down 2014, in which he struggled to generate swings and misses and battled control issues all year. He was still young, however, just 24-years-old, so he still had time to develop into a more complete pitcher, rather than the thrower he seemed to be in 2014. I did not see anything close to Miller’s remarkable turnaround coming; he has become a completely different pitcher. During his time in St. Louis, Miller was a fly-ball pitcher with swing-and-miss stuff, but he struggled to consistently generate the whiffs expected with such great stuff. In half a season with Atlanta, Miller has moved into the league’s top-25 in GB%, after ranking in the bottom-20 last season. He has done this while also improving both his strikeout and walk rates. Here is a graph of Miller’s 2014 statistics compared with his numbers this season. Is Miller’s turnaround legitimate or has his success this season been a fluke? While Miller is not likely to sustain an ERA in the low-2s moving forward, his groundball and strikeout numbers seem genuine. That is because these statistical improvements have been accompanied by adjustments in Miller’s repertoire, as he has adopted both a sinker and a cutter that have changed his results. When Miller was with the Cardinals, he featured a fourseam fastball that reached the mid-90s and a curveball that showed flashes of plus, but lacked consistency. This year, however, Miller has used his sinker more frequently than his straight fastball and has implemented his cutter 20% of time, compared to just 6% previously. These two pitches have both contributed to Miller’s new groundball tendencies and have even improved his fourseam fastball, which now generates more swinging strikes than last season. The best predictors for a pitcher’s future success are strikeouts, walks and home runs and Miller has developed an excellent approach for controlling these three outcomes. He has improved his command and refined his repertoire to increase his groundball rate while also generating more swings and misses. While Shelby Miller has controlled the three most important outcomes for a pitcher very well, Carlos Martinez has mastered just one of the three. Martinez is among the NL leaders in strikeouts, but he has struggled to limit walks and homeruns, which could catch up to him moving forward. Miller’s ability to control those outcomes better than Martinez is what gives him a brighter outlook. While Miller’s transformation is very impressive and noteworthy, it does not match what Martinez has consistently produced. He has maintained a strong strikeout rate throughout his career and even seen it increase each season. He has coupled his healthy strikeout numbers with impressive groundball rates, with each season’s GB% topping Miller’s career best groundball rate. Above is the career numbers for both Martinez and Miller. Miller has the career advantage in ERA, but Martinez trumps Miller in his peripheral statistics, such as FIP and xFIP, which are both better predictors of future performance because they only consider strikeouts, walks and home runs. However, looking at Miller’s career numbers isn’t entirely fair after we concluded his adjustments this year are likely to last. Looking strictly at this season, Martinez again bests Miller in xFIP, but not FIP. This is because Martinez has been plagued by an abnormally high HR/FB, which does not correlate well year-to-year, so he can expect to see that figure regress. Martinez’s advantage in xFIP is noteworthy because it corrects for the random variation of a pitcher’s HR/FB rate and is better at analyzing a pitcher’s true talent level. The other positive for Martinez is his age and experience, as he is one year younger and also has one more year of team control, which means he will not reach free agency for another year after Miller. Even if you believe that Miller has a slight talent advantage, Martinez’s extra year of control makes him a more valuable player for now and the future. In just his first season as a full-time starting pitcher, Martinez compares very favorably with Miller, who is already in his 3rd season as a starter. While Miller’s improvements this season put each of them on the same level, Martinez is making adjustments of his own that will elevate him beyond their current level. In an effort to eliminate his platoon splits against left-handed batters, Martinez has increased his usage of his changeup, which he rarely featured out of the bullpen, but has now become an excellent pitch for him against lefties. Martinez has been a very raw talent ever since his initial promotion to the Majors, but has shown tremendous improvements in his first season as a starter. Not only has Martinez’s pitch selection improved, but his composure and mentality on the mound have also come a long way from his days as a reliever. Martinez appears to have really blossomed under the mentorship of catcher Yadier Molina and carries himself with the confidence of a rising star. His improved demeanor on the mound is certainly a positive, but it is his improved pitch selection and consistent success through his time in the Majors that make him the more valuable of the two pitchers moving forward. The argument can certainly be made that either of these two young pitchers is more valuable, and either starter you choose will bring enormous value. I favor Carlos Martinez to Shelby Miller because I believe his strikeout numbers and ability to miss bats will last long into his career. He has also consistently generated groundballs at a rate among the league leaders. With his propensity to generate groundballs, Martinez is more likely to avoid being plagued by home runs. Miller has certainly shown better control than Martinez, but Martinez looks better at generating strikeouts and limiting home runs, which will lessen the impact of his higher walk rate. Another factor in Martinez’s favor is his extra year of team control, which lessens his cost to his club and gives him more value, with all else equal. Miller’s improvements have been quick and impressive and I do believe they will last, but Martinez still has more value moving forward. This entry was posted in Uncategorized and tagged atlanta braves, Carlos Martinez, Shelby Miller, St. Louis Cardinals by baseballstooges. Bookmark the permalink.